This post is sponsored by IZZE, a delicious drink we are all obsessed with! The changing of the seasons from fall to winter brings with it so many of our favorite holiday moments… Chilly evenings spent indoors, curling up by roaring fireplaces and glittering Christmas trees, and the joyful echo of “Happy holidays!” everywhere we turn. Along with these wintery wonders comes the urge to eat, drink and be merry with our nearest and dearest. And while there’s nothing better than getting cozy and enjoying our favorite fall dishes (hello, squash crostini and bacon wrapped dates), doing so truly isn’t complete without a delicious holiday sip, of course. To us that means having plenty of our favorite flavors of IZZE Sparkling Juices and Sparkling Waters on hand to mix up refreshing drinks all season long. 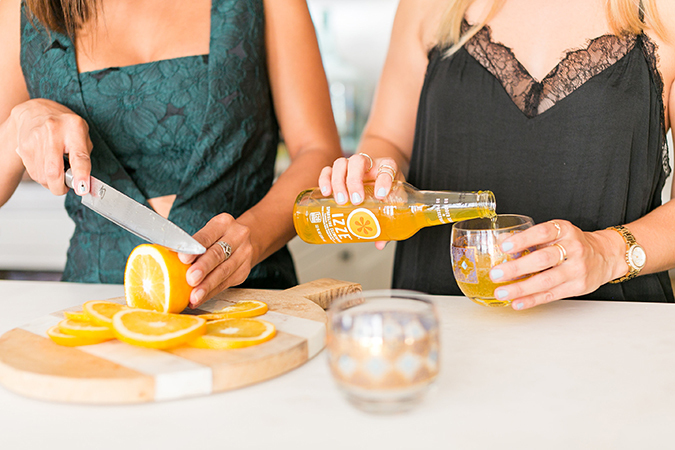 We’ve said it before, and we’ll say it again: IZZE Sparkling Juices are the #1 essential we like to have on hand when it comes to entertaining. They come in 8 fruity flavors—apple, blackberry, blueberry, cherry lime, clementine, grapefruit, peach and pomegranate—all of which are light, bubbly and refreshing. Those flavors are all made with 70 percent fruit juice and a splash of sparkling water, making them a delicious, better-for-you drink choice to serve to your friends and family. IZZE tastes great on its own, and serves as the best mixers for cocktails. Plus, these drinks fit in with any kind of holiday entertaining, from casual secret Santa get-togethers to festive holiday cocktail parties to fancy New Year’s Eve bashes. One of our favorite IZZE flavors this time of year is clementine. The tangy citrus notes combined with the fizzy texture is the perfect combination for cocktailing around the Christmas tree. 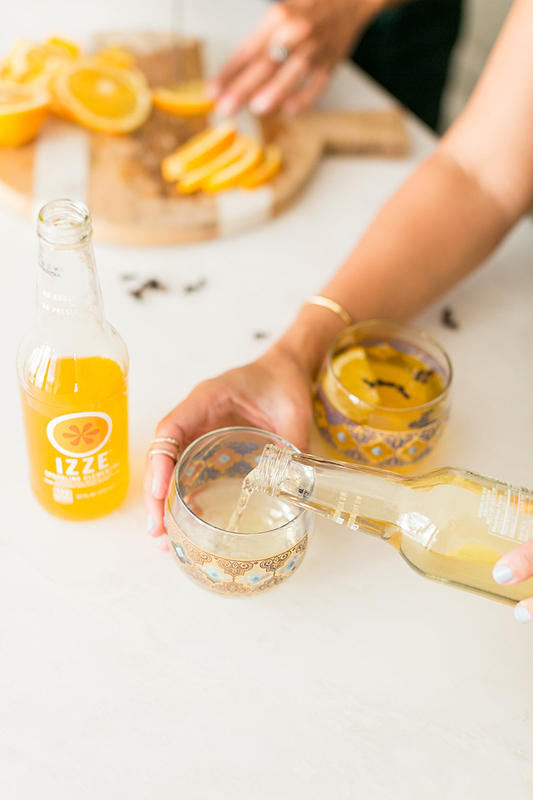 So, we’ve embraced the season’s flavors of citrus and cloves in a delicious, fruity sip using one of our favorite IZZE Sparkling Juices. Fill a lowball glass with three parts IZZE Sparkling Clementine and one part gin, if making into a cocktail. Add the fresh squeezed juice of ½ lemon, then top with orange slices, cloves and stir. Enjoy! For a virgin version, fill almost to the top with IZZE Sparkling Clementine, leaving some room for fresh squeezed lemon juice and garnish. Then, squeeze ½ lemon into the glass, and top with an orange slice and cloves. Stir and enjoy! 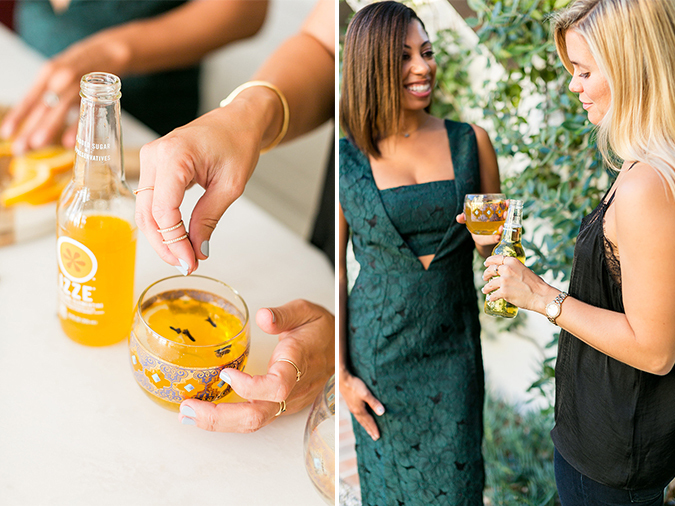 This sweet and fun cocktail is perfect (and super easy!) to serve at your upcoming New Year’s Eve festivities. We made two versions: One using our IZZE Sparkling Pomegranate and another using our IZZE Blackberry Pear Sparkling Water. We love how IZZE Sparkling Waters are light (every flavor only has 10 calories! ), low in sugar (only 1-2 grams per bottle), made with organic natural flavors, and flavorfully bright. 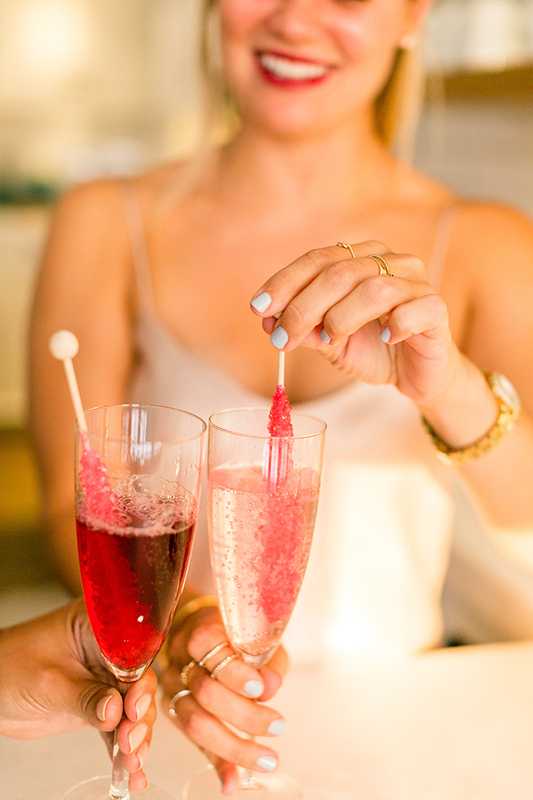 This blackberry pear flavor pairs particularly well with the splash of champagne and colorful rock candy. 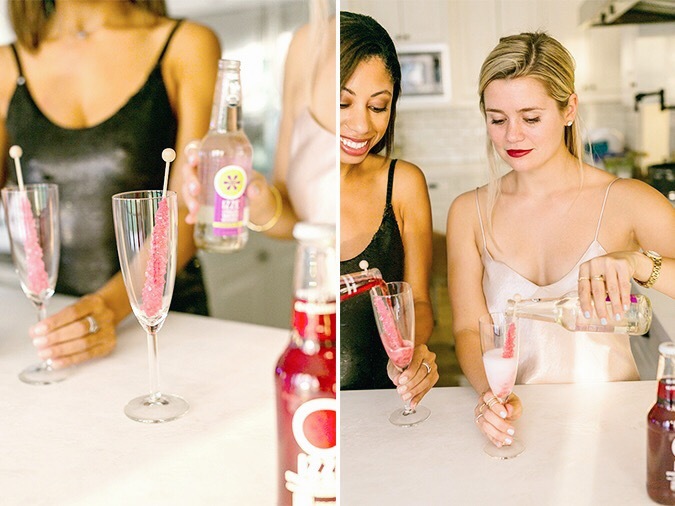 Here’s how to make our Rock Candy Swizzler! Pour one part IZZE Sparkling Juice or Sparkling Water and one part champagne (if you desire) into a champagne flute. Add a rock candy stick and stir to mix. Easy as that… Enjoy! Besides the clementine, blackberry pear, and pomegranate flavors we used in these cocktails, we also love stocking up on IZZE’s Sparkling Apple during this time of year. They’re the perfect flavors of winter, and make for the best cocktail mixers (or standalone drinks!). 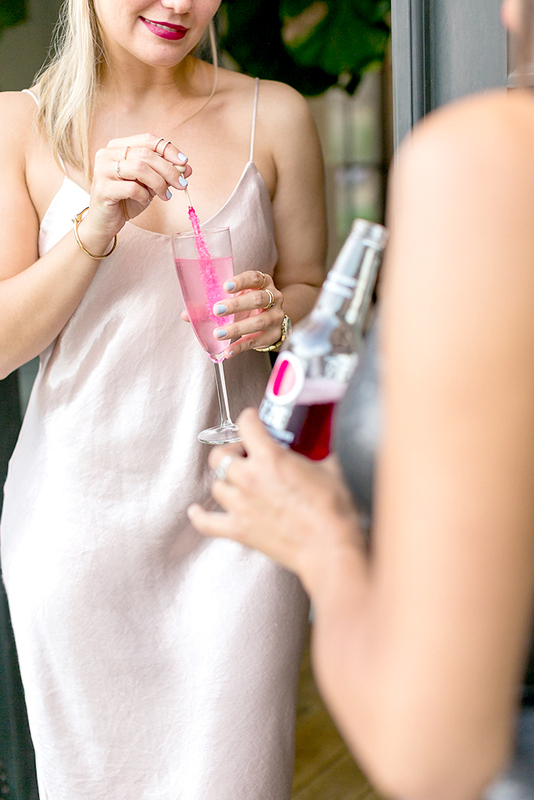 Whether you’re having a Christmas party, an intimate winter dinner, or a roaring New Year’s Eve bash, there’s an IZZE flavor for every occasion. What fun things will you mix up with your IZZE flavors this winter? Let us know if you have any fun cocktail recipes in the comments below so that we can try them too!